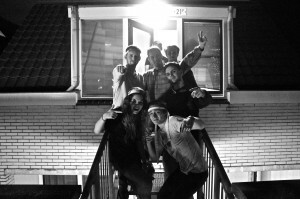 My study abroad time in Den Haag is quite possibly the best experience of my life. I learned so much, grew as a person, and got to see a ton of amazing things the world has to offer. My only regret is that I didn’t stay longer. Great friends, a beautiful city, and memories that will last a lifetime gave Den Haag a homely feel that I believe is a very rare find. This adventure was truly the experience of a lifetime and I feel so lucky to have been given the opportunity to study there for the Fall semester. Reflecting now, I can think of plenty of great things about the city itself, but I will start with the school. 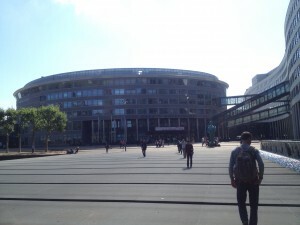 The Hague University is very different from the campus lifestyle we are used to at UofL. 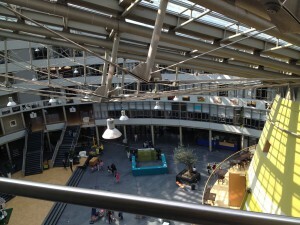 The entire “uni” is one building with four different sections. At first it was hard to wrap my mind around how 21,000 students studied in the building, but the structure and innovation of the building is nothing to sleep on. There are classrooms everywhere you look in each section of the building. The rooms allow a class size of about 20 to 30 students and there is one big lecture hall where Year 1 lectures are held. The professors are awesome. I loved every class I had just because of the unique personalities that each different professor had to offer. They made class enjoyable even when the material was not. I really enjoyed the schooling during my time because of the excellent staff and the distinct uni. My schedule allowed me to take Monday’s and Friday’s off. Six courses and twelve hours was a perfect workload for me during the semester. It allowed me to travel Friday through Monday almost every weekend. 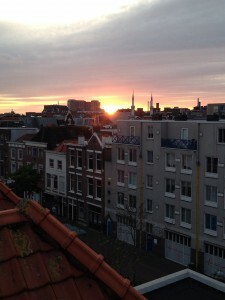 A normal day whilst in the Hague would consist of going to class in the morning, grabbing a bite to eat with friends or making a delicious meal, and just relaxing with great friends in our apartment which overlooked the city. I am a terrible trip planner and deal finder so I was lucky to have Corey and Albin to travel with. The food in Den Haag is different. Going to the grocery store once a week was normally enough to satisfy my hungry belly. If you plan on studying in the Hague, remember to save your cans and bottles! You can make a ton of money back on your drink purchases my just returning bottles and crates. It may even cut the expense in half. 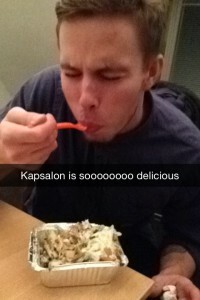 A unique treat that I loved dearly was kapsalon from my favorite Turkish kebab shop, Diva. My mouth is watering just thinking about it now. Kapsalon consists of fries smothered and covered in kebab and melted cheese with garlic and spicy sauce to accompany. All that is covered with shredded lettuce, tomato, and onion. A delicious midnight snack that I would even venture to say beats Taco Bell fourth meal. It is a must try in Den Haag. The greatest part of the entire trip was not what I expected. I expected to travel see the world and return excited to come home. That was the case, but with a little extra something. The friends I made in my time there are irreplaceable. This trip taught me that no matter where you are from or what past you carry with you, people are essentially the same. I have so many memories of times when I would be thinking the same thing as my French roommate, Antoine. We were so similar it was scary. I enjoyed every moment I had with him and the moment he dropped me off at the train station for my trip home, I felt like I was leaving a brother. I know that I will see him again and that we will be friends throughout our lives, but my bond with him is something very special and I will hold onto that forever. Leaving Den Haag was bitter sweet. I am so grateful for the experience I had, but I was not ready for it to end. Emotions are running high as I’m writing this and that shows me how special it truly was. It tells me that it actually means something. It tells me that the words I am writing are genuine and true. 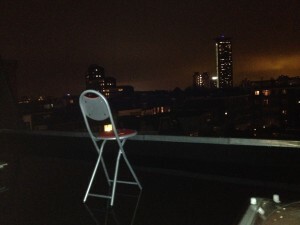 I offered Den Haag my heart and soul on this trip and it filled it with love and memories I will carry with me forever. I thank my parents, UofL, all the advising staff, and the good Lord for the opportunity given to me. It really was the trip of a lifetime. This entry was posted in Uncategorized by jczimm01. Bookmark the permalink.